One thing that's made our pack list this time a watch - actually two. Neither of us typically wear one; i've actually only owned three in the last 20 years - the first, a high school graduation present from my parents that was stolen a few months into college; the second, a cheap, knock-off "Caspio" purchased in a market in Cambodia for $4 (it lasted just long enough for us to board our plane home two weeks later); the last, a new one bought just this weekend, especially for our upcoming trip. Im planning on have this one much longer than the last two. We always bring our phones with us on the road, but strongly dislike taking them out with us while we're wandering. We find it's far more fun to navigate foreign streets without the help of a mapping app. Sure we get lost every once and a while, but that's part of the fun. What's not fun is not knowing the time. Though we typically don't keep a strict schedule while traveling, preferring instead to let the day take us where it will, it does help to know the time without having to ask someone on the street. In addition to running for trains, waiting for rides, making reservations and meeting friends, we could have used a timepiece as we visited a handful of museums through Europe that offer free or discounted admission for a few hours one night a week. This is a great way to save a few bucks, and still see some of the major sites. Madrid has a couple of them here and Paris has a few here. The problem is, the museums only offer this in a small window, so if you want to see as much as possible, it really pays to be there right when that time hits. Without quick access to the time, we'd guess the hour by the length of the queue, the chimes of the nearest church bell or try to read the position of the sun in the sky (yes, we tried). Going to the Louvre at night will save you a few dollars and is typically less crowded. WATER RESISTANCE: We are not planning on doing any deep sea diving - at least not this trip - but we want to make sure we don't have to worry about them in the rain or in a quick dip. EASE OF CARE: With some of the work we do in exchange for lodgings, our hands can get a bit dirty. We want to make sure we have watches that stand up to some hard work and still clean up easily. Any watch with a linked wristband is out because of the likelihood of them filling with muck. LOW PROFILE: Finally, we want something that is quietly stylish, fits our personalities without being too flashy and won't make us a target for thieves. 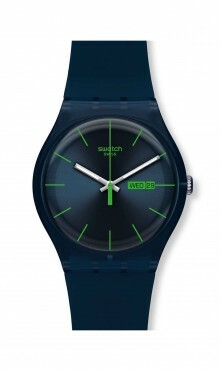 The solution: The Swatch store at the Mall of America sold us on two watches from their New Gent line. They combine precision Swiss engineering, water and shock resistance, and a wide variety of styles for our perfect all-around watches. They also come with a two year warranty that covers all internal problems, and the battery is said to last at least three years so longevity is not an issue. We couldn't be happier with them and look forward to logging many miles (and maybe a couple less mad dashes for the train) with them on our wrists. Check out their Facebook or Twitter accounts, and if you have a favorite watch that you would love to talk, please let us know.